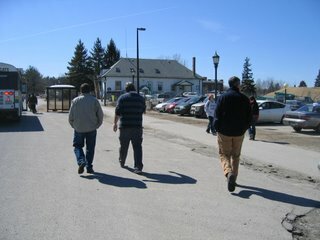 Mark, Bill, Anthony, and I walked over to the Marche to have lunch someday last week. The Marche is located in the Living and Learning area which is right where the main dorms are for UVM students. There's a huge selection of food choices, such as pizzas, sushi, sandwiches, fried chicken, mexican, italian, and so on. We don't have lunch here often but when we do, it's generally to do some people watching.